This month, Alamo Drafthouse Chandler will be offering a menu inspired by their Drafthouse Recommends selection The Big Sick. Produced by Judd Apatow and based on the actual (and unusual) courtship of comedian Kumail Nanjiani (SILICON VALLEY) and Emily Gordon (author, SUPER YOU). The film is touted as hilarious, emotional, touching and very, very honest. This honesty shapes the culture clash of a Pakistani Muslim dating a Southern white girl, a narrative that places the Nanjiani family and their Pakistani culture at the heart of the film. 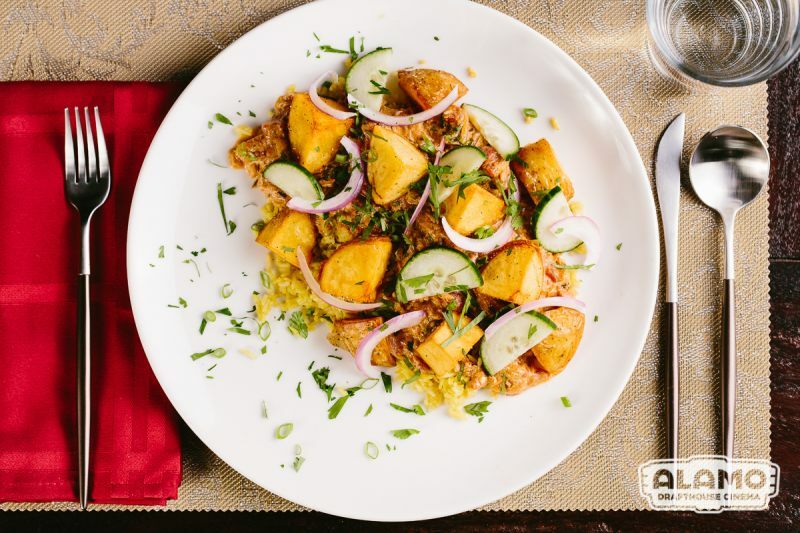 To celebrate, Alamo Drafthouse’s chef Brad Sorenson worked with Kumail and Emily to create a menu that reflected the meals the two shared while dating and the rich, tasty and traditional dishes that would be served at the Nanjiani family dinner table.